The assessments performed by Azure Security Center analyze risk factors in your hybrid cloud environment in accordance with security best practices. These assessments are mapped to selective compliance controls from a supported set of standards. In the regulatory compliance dashboard, you get a single view of the status of all assessments within your environment, in the context of a particular standard or regulation. As you act on the recommendations and reduce risk factors in your environment, you can see your compliance posture improve. In the Azure Security Center regulatory compliance blade, you can get an overview of key portions of your compliance posture with respect to a set of supported standards. Currently supported standards are Azure CIS, PCI DSS 3.2, ISO 27001, and SOC TSP. In the dashboard, you will find your overall compliance score, and the number of passing versus failing assessments with each standard. You can now focus your attention on the gaps in compliance for a standard or regulation that is important to you. The ASC regulatory compliance dashboard is designed to help you improve your compliance posture by resolving recommendations directly within the dashboard. Click through to each recommendation to discover its details, including the resources for which the recommendation should be implemented. The information provided by the regulatory compliance dashboard can be very useful for providing evidence to internal and external auditors as to your compliance status with the supported standards. Stay tuned for additional features, like the ability to create and export reports that can be readily shared with stakeholders. In addition, data from the ASC compliance dashboard will soon be integrated into Compliance Manager, delivering the benefit of automated assessments from Azure directly into the Compliance Manager experience instead of requiring manual processes. 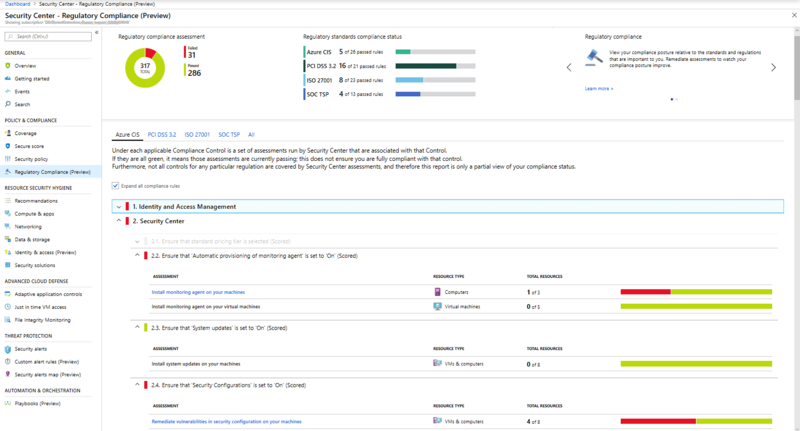 The regulatory compliance dashboard preview is available within the standard pricing tier of Azure Security Center, and you can try it for free for the first 30 days. To learn more about regulatory compliance in Azure Security Center see the documentation, “Tutorial: Improve your regulatory compliance.” Try it out and let us know what you think!